Brought to you by President Cheese. Visit ArtOfCheese.com for a chance to win $50. People often ask me what my favorite “kind of food” is. I think they’re expecting me to say “Mexican” or “Italian,” but I always emphatically answer “PARTY FOOD!” For me, it is a whole category of food. I don’t just mean potato chips casually thrown in a plastic bowl, or hot dogs on the grill (although both of those things are good, too). I mean special bites, presented in a lovely manner that make a party feel truly special. Sometimes, I’m positive that I was a wedding caterer in another life. 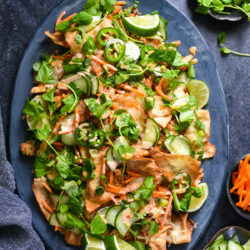 I’ve found that often, the most popular bites at a party are the ones with the simplest flavors. Those that take just a few in-season ingredients, combine them in the best way possible, and present them in a beautiful package. 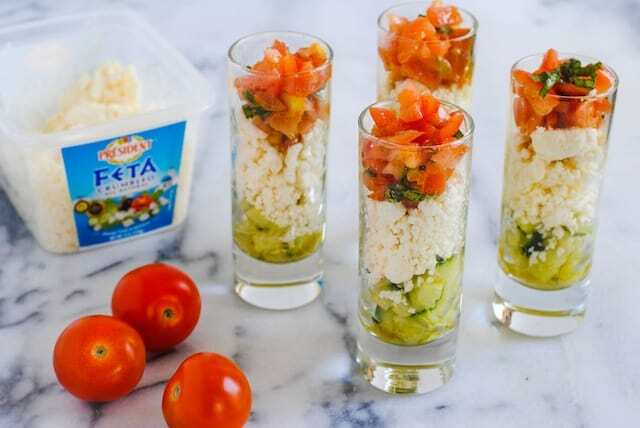 There’s nothing complicated at all about making a feta salad shooter like this one. 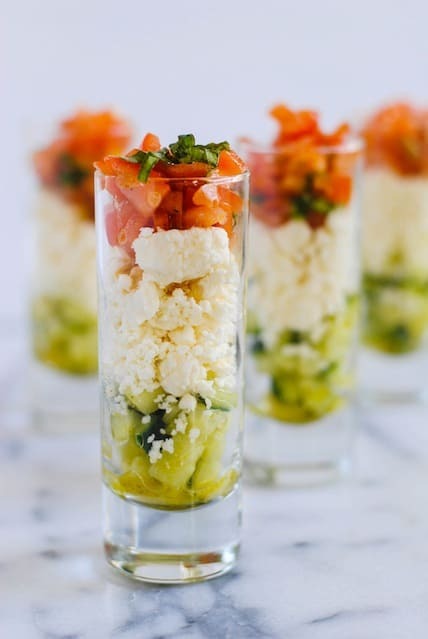 At it’s core, it’s just layers of crunchy cucumber, creamy and tangy Président® crumbled feta cheese, and fresh tomato tossed with a little vinaigrette and basil. That’s it. It’s a salad, but an artful salad. The folks at Président® have the same philosophy as I do when it comes to party food. They are experts when it comes to cheese, and their website is full of simple yet sophisticated recipe ideas for a cheese party, like Feta Skewers and Brie on Garlic Bread. Their high-quality cheeses will enhance anything you choose to make. Embrace “the art of cheese” at your next gathering, and enjoy the compliments! In liquid measuring cup, whisk together vinegar, mustard, salt and pepper. While whisking, slowly drizzle in oil until all oil is incorporated. Place cucumber in one small bowl; place tomatoes and basil in second small bowl. Divide vinaigrette between cucumber and tomato bowls; stir both mixtures, separately, until well combined. 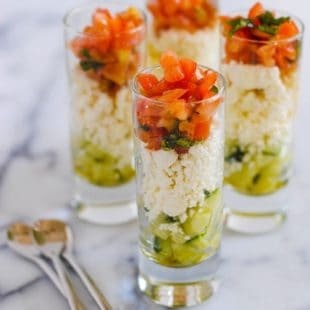 In sixteen (2-ounce) shooter glasses, layer cucumber mixture, cheese and tomato mixture. Serve immediately. Disclosure: Sponsored posts help me pay for the costs associated with this blog (groceries…lots of groceries), and help support me as I pursue a career in recipe development and food photography. All opinions are 100% my own. I’m totally with you on party food. LOVE it. There’s something about cute little bites of things and lots of assortment that makes me super happy. 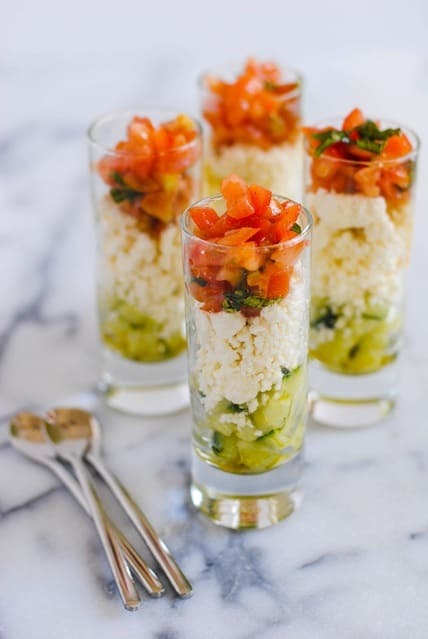 I do some catering on the side and these little salad shooters would be perfect for an event I have coming up! Thanks so much, Kristen. 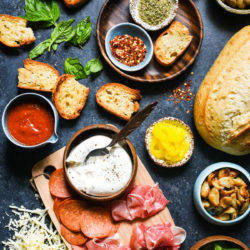 I think that’s what I love about party food – little bites, lots of assortment. It’s the most interesting way to eat! 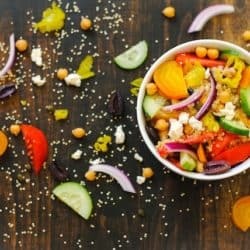 Love this- SUPER easy and cute and hands free way of eating Greek Salad! I don’t like feta (please still be friends with meeeeee!) but I love the look and idea of these pretty layered salads. Party food IS the best! Wish I were munching on a big plate of little, delicious appies right now! I GUESS we can still be friends. 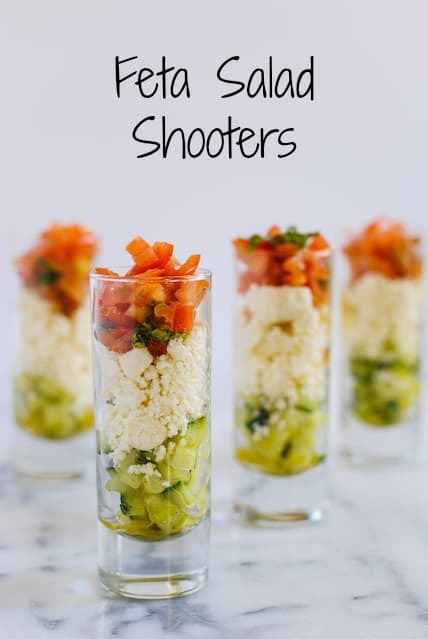 Actually, these shooters would work with blue cheese too (although if you don’t like feta, it seems unlikely you’d like blue). I think they’d also be really good with a layer of something briny/salty instead of the feta….like chopped olives or somethin’.